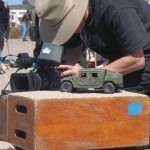 Fred Olen Ray lines up a shot at Leo Carillo beach during filming for “Super Shark.” Back before CGI, this was how you got a Hummer when you couldn’t afford the real thing. Wait’ll you see the shark! 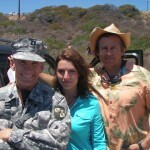 Me, Sarah Lieving and Tim Abell.